I just found a website that gives me flashbacks to my past. Zaharakos is an ice cream parlor that is located in my hometown, Columbus, Indiana. 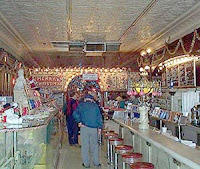 The parlor was first opened in the early 1900's. While I was growing up, Zaharakos had a great "old time" feel. 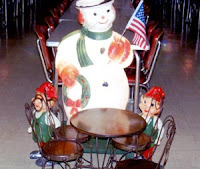 During the holiday season, they would hang up decorations and lights, so each year my parents would take my brother and I to Zaharakos to see the decorations. The highlight of every visit to Zaharakos was walking to the back of the store and looking at the rare Welte orchestration. We would always ask them to turn it on so we could listen to it. Did I mention they also had pretty good food and great drinks (old soda fountain drinks). My special (mix of hand squeezed orange-aide/lemon-aide). The Green River was pretty good too. In the early 2000's the Zaharakos' family closed the ice cream parlor. Luckily, an investor purchased the store and is in the process of restoring the landmark. I look forward to visiting the parlor the next time I am in Indiana and they are open!